Bhubaneswar: The long awaited plan for riding to Raipur matched perfectly on this fairly extended holidays over the weekend of Republic Day – 2018. It was a National Holiday on 26th January, 27th was Saturday and 28th was Sunday, the BCAC Cyclonauts couldn’t resist their urge to mark a special long distance ride to celebrate the grandeur. The plan, which was being hatched since almost a year, after Bibhu Sir and Aarti Ma’am shifted to Chhattisgarh, find a perfect timing for completion and thus rolled on. Sougata ji coordinated this Cycling Expedition on behalf of TATA Motors in association with BCAC. The entire roadmap was planned with refreshment and hydration stations at TATA Motor’s outlets on the highway from Bhubaneswar to Raipur stretching over a distance of almost 575 Kms. The event was flagged off by the President of BCAC – Sj Sanjeeb Panda Sir at Consortium Auto, Pahal in the evening of 25th January. 8 (Eight) BCAC Cyclonauts started pedaling towards Raipur through Gopalpur, Trisulia and Athgarh road. In the cold dark night it was a pure bliss to ride on the bicycles fitted with flashing lights, reflective clothing and bright headlamps. People on the way were too curious to see the cyclists at this late hour of the winter night. The peloton left Bhubaneswar at around 9:15PM and touched the Athgarh-Angul highway through the forests, hills and sleeping villages. In the silence of the night all riders were shouting loud with joy and enthusiasm for this super-endurance ride with a target challenging the standards of BRMs. The group halted at Minar Hotel at Athgarh to take a late dinner. Srinivas ji, who was on his first endurance adventure with BCAC, arranged the dinner here which was quite essential to boost the energy level for the riders, who were supposed to cover another 50 odd kilometers post-midnight. After dinner, the riders reached a fuel station after Rasol, where we decided to take a nap. It was a seer adventure to spend the night inside self-erected tents. The next morning was Republic Day and the riders were rejuvenated after a few hours of sleep. We hoisted National Flags on our bicycles and road on the Athgarh-Badkera route. On the way, we met many school kids doing march-past, shout-out “Bharat Mata ki Jay” and took some snaps with them. At Beda Chowk (just before Bantala Chowk) Mr. Manoj Amanta and Mr. Susit along with the youths of Hamamira village welcomed us with garlands and energy drinks. It was quite an unexpected welcome for the cyclists at such a point of travel. It was really tough for us when we touched the National Highway for Sambalpur at Badkera. The on-coming traffic was huge and the roads were simply treacherous. We have to cover almost 200 KMs on this day till Sambalpur and we were at awe how to cover the distance within limited time. By the time we reached Bamur, it was almost evening and we have to cover almost 90 more KMs on this highly unpredictable road for cyclists. However, the josh was on high and together we covered this distance with bumps and booms. We reached at Sambalpur at around 10:30PM. Thanks to the Vice-President of BCAC, Vijay ji who arranged a comfortable stay at Hotel Royal Inn with a simple and delicious dinner. On 27th morning, we focused our attention on covering the roads with safety and comfort after the previous night’s nightmare experience. We reached Vikas School at Bargarh (40Kms from Sambalpur) for a grand reception. We were overwhelmed with the warm reception by almost 300 students of the Vikas School. 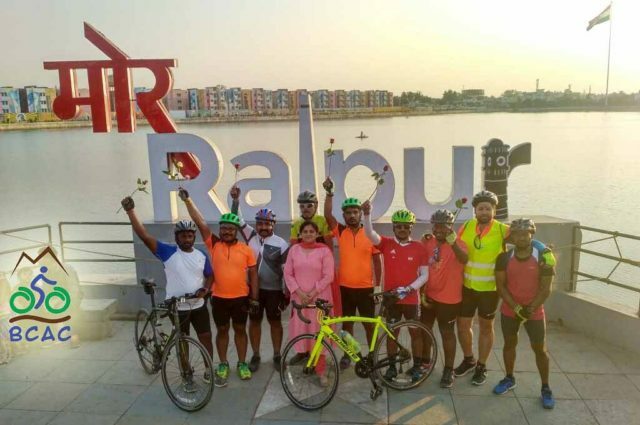 The Chairman Mr. Murali Krishna, MD Mr. Nagesh and Mr. Bhaskar Rao along with Teachers and Students offered a floral welcome to the cyclists on the Mission Raipur. The General Secretary of Bargarh Athletic Association Mr. Jugal Prasad Singh and member Mr. Nilesh Kumar Desai also welcomed our cyclists along with school kids of Vikas. It was really a memorable welcome for the cyclists with such a wonderful reception with breakfast. 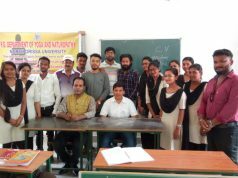 Ajay interacted with the kids and motivated them to adopt any hobby along with studies for a successful career and healthy living. 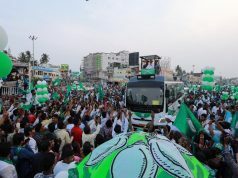 After this grand reception, the peloton moved forward towards the final destination, Raipur. As we were approaching the border, it was quite a search for lunch break. The check-gate at Sohela border has become non-functional and we were simply riding forward to search the check-post. By this time, the riders were surprised to get connected with Bibhu Sir and Aarti Ma’am, who rode all the way from Raipur to meet the riders near Sohela. Nihar, who also accompanied Bibhu Sir informed us that there is only one Dhaba (road-side eatery) on the way till Saraipali. We decided to take lunch at the 5-Star Dhaba (Yes, that was the name!) before covering further. The roads inside Chhattisgarh was simply amazing and we saw the best of the National Highway with wide four lanes, proper signage, road electrification, accident helplines and even SOS call booths on the highway. We enjoyed the ride on the road and covered another 90 odd KMs from Saraipali to reach Pithora. We decided to take a break at Pithora for the night for safety of the riders. Bibhu Sir helped us to book a guesthouse at Pithora, where we made the night halt. On early 28th morning, we started our ride to our first destination Raipur. Near Sirpur, Bibhu Sir joined us on his bicycle from Raipur to guide us to our final destination. On the way we halted at Raju Dhaba on Mahasamund- Raipur Road for lunch. Post lunch there was only 11 more kilometers to reach the Marine Drive Raipur over Katora Talab, where we are supposed to conclude our ride. We reached Marine Drive to explore another magnificent view of the changing Raipur with beautiful picturesque of the lake, high-mast National Tricolor and a soothing signature of “More Raipur (My Raipur in Chhattisgarhia)”. Aarti Ma’am did a heart-touching aarti of all riders and presented a mesmerizing floral welcome to the cyclists. We took a lot of selfies and snaps at this signature location before calling it the end of Raipur Expedition. As the ride synced with Republic Day, we didn’t forget our ritual of collecting abandoned and thrown-away flags for giving due respectful burial to the discarded National Tri-color with proper procedure. Sougata Sinha Roy, Srinivas Sahoo, Kallol Krishna, Manas Ranjan Gouda, Udaynath Mahakud, Siba Shankar Senapati, Santosh Kumar Rout and Ajay successfully completed the ride covering 575+ KMs within a time span of 67 Hours (including the rest and others).